How to water – I would like to take a short break from pruning for a moment, to talk about watering. But, it will be only a very short break because there is a strong connection between watering and pruning. Before watering – Stop a second, look at your plants… work on developing your 'green thumbs' by examining, feeling and trial and error. Many people, when watering their plants, drown them in too much water. But, adding too much water is not a solution, as a matter of fact in most cases it will only make things worse. Maintain the following guidelines by beginning to recognize the soil type, and noticing what the plant looks like. Soil – First, identify the soil type, is it sandy? muddy? each soil type requires a different watering method. Plants that grow in sandy soil will be more likely to need a small amount of water in short intervals, while those growing in muddy soil my need a large amount of water with large intervals between watering. How to water - Every plant has different needs and reacts differently to different amounts of water. On the other hand, as there is a huge variety of plant types, adjusting your watering to each and every plant may be somewhat of a challenge. Still, there are a few basic guidelines you can follow, which will keep your garden in good shape even if the water supply is not always precisely accurate. My way - I always prefer to give more water. I like to soak the soil around the plant and wait for longer intervals between watering. Why? - One of the most important basics for solid and stable growth, is drainage. Plant roots like and need water, no doubt about that. But just like us humans, not too much water. 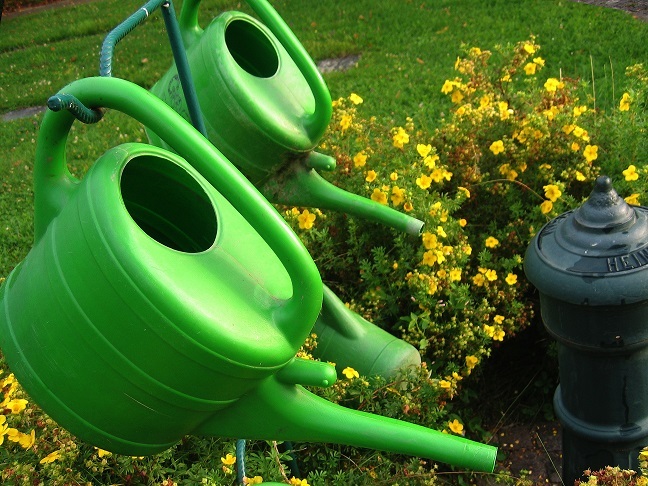 After watering, plants need a little break to allow them to continue to grow and develop. Also, in order to develop, roots need air to breathe. When the soil is flooded it blocks the air, and then if you keep watering on a daily basis you will flood the plant, stunt its growth and possibly kill it. Therefore, from my experience, more water + longer intervals between watering cycles, will provide enough water for the plant needs and the longer intervals will force the roots to grow deep and expend. Btw, that's how roots get stronger – by sending long strong roots into the ground. That way they can send more ‘supplies’ (minerals etc.) back into the plant, making it healthier and stronger. Watering at short intervals will prevent the proper growth of the roots. The plant will invest its energy in developing many small thick roots, instead of growing new stems, leaves and flowers. The plant will be weakened, and in such condition plants also attract diseases. So, how much water? For planters, window boxes, containers etc... it’s simple. Water until you see it drip out of the bottom drainage hole and stop. That's it! 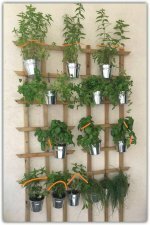 Same guideline for how to water indoor and outdoor planters. The only thing that may change are the intervals. Try to establish a routine watering schedule, for example: Monday and Thursday - same amount of water each time. Much like us, plants too like their routine. You will have to practice until you get it right, but if you trust your instincts, look, feel and practice – you’ll have very happy healthy plants around you. As for your home garden, same rules apply here, except that you can't check the drainage holes. What you can do is stick your finger in the soil close to the plants roots. If it’s dry, add water, if its moist check again in a few days. It’s all about the look and feel of the soil. (And, by-the-way, you can always use a water gauge). What that got to do with pruning ? Thought you would never ask… well, when a plant is dealing with dry or flooded soil, it’s already having a hard time and putting energy into surviving. In fact, your plant is struggling to survive, so pruning it right then, would not be a great idea. It would only make things harder on it – wait a while, let things calm down and then prune.